New classes started March 23rd 2019 but they go slow and are self-paced. Plenty of time to join and catch up! My name is Marc Williams and i will be the main facilitator of our journey. This website is a continuation of the work of the amazing ethnobotanist, explorer, and humanitarian Frank Cook seen pictured here on the right. Frank conducted this class through email for 9 years before passing away suddenly in the summer of 2009. i am grateful to be launching our tenth year of this course in a website format. More information on Frank's continuing legacy can be found at www.plantsandhealers.org. The information that i am sharing with you is the result of over 18 years of work and both a Bachelor's and Master's degree program process as well as attendance at hundreds of conferences comprising many thousands of hours of research and education. The sticker price of the degree programs alone was over $70,000 dollars. i worked at least 40 hours a week while taking a full course load to get my Bachelor's degree and at least 15 hours a week in graduate school to help offset the cost. In addition i received multiple scholarships and a fellowship to defray expenses as well. That said, i ended up with $30,000 in student loans of which $10,000 remain after paying thousands of dollars additionally in interest. However, in honor of Frank's tradition this class is held by donation! A suggested amount of $100 is greatly appreciated but any amount is helpful and needed! We focus on understanding the characteristics and classifications of plant families in our class. Familiarity of patterns within the plant world can allow one to demystify the "green wall" and begin to have confidence in the usefulness and abundance of plant resources all around us. The heart of the plant talks is a tour through the world of plants using the book Botany in a Day (6th ed.) by Thomas J. Elpel. This newest edition is fully updated in regards to taxonomical classification. We are excited to incorporate it into the learning on this website. Other texts will be cited when available and appropriate. However, everyone taking this course should at least have access to the most current edition of Botany in a Day if possible to reinforce the learning. The book can be purchased directly from Thomas at www.hopspress.com/Books/Botany_in_a_Day.htm. Authors make very little royalties when their books are purchased from resellers. Please purchase this book and others in the resources section directly from the authors when possible! If you already have an older version of Botany in a Day then you can give it to a friend just starting their botanical journey or make do while going through the class if necessary. Every two-three weeks a new entry concerning readings from the text is posted to this website, no official registration is necessary, just check the website as you are able, to access each class. A photo album will accompany posts when possible. Very excited to add many new pictures this year in particular. i am also looking forward to adding more monographs of plant families and many more electronic resources in 2018 as well given the support necessary for so much concerted effort.The course will continue through December. With each posting excercises will be given to provide students to deepen their understanding of class material. Your reflections from the classes are greatly encouraged and appreciated. Take time to ask yourself how much you can commit to this process. Complementing the readings with the exercises will help you internalize your understanding of course content. 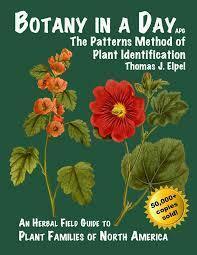 In 2010 i took the opportunity to greatly update and expand upon Elpel’s 5th edition of Botany in a Day. by going linearly family by family with postings that were 5-15 pages in length. Over 130 pages containing updated plant classifications and much additional supplemental ethnobotanical information was added. All of this information will remain available under the archived classes at the online tab of the site. Subsequent years have followed Frank Cook’s pattern more closely. Posts focus on specific categories of plant information. The first few posts will cover the introductory sections of Botany in a Day (6th ed/5th ed.) Other postings will center around family themes seen below. In honor of Frank's tradition this class will be held by donation. The suggested amount is $100 but any amount is helpful and greatly needed! Proceeds will go to further my work as an ethnobotanist and teacher and to organizations supporting the work of Frank Cook. Any other forms of appreciation will be gratefully and humbly accepted! Commentary on the classes or plant family monographs is especially appreciated. As Frank would say "Please give what you can, receive what you need"
marc williams has carefully selected and enjoyed edible plants wild and cultivated for many years. Foragers often need numerous, quality references and personal knowledge gained from studying these materials through classroom and "hands on" training in order to harvest safely. Please seek professional advice before using any plants if you are at all unsure. When in doubt leave it out!!! marc williams or anyone associated with the development or distribution of material at www.botanyeveryday.com assume no liability for any actions taken in viewing, reading, or using any information provided herein. Please use caution when collecting, preparing, and utilizing these plants, just as you should always use caution and common sense in the outdoors. marc williams as the main developer of the website www.botanyeveryday.com makes every effort to provide and maintain accurate, complete, useable, and timely information. However, the data and information herein are provided with the understanding that they are not guaranteed to be correct or complete. Conclusions drawn from or actions undertaken on the basis of, such data and information are the sole responsibility of the user.